The other day I was binge watching Mozart in the Jungle. I love this show not just because of the story, characters and the set pieces but because of what it teaches me about leadership. Mozart in the Jungle presents the fictional transformation of the New York Symphony from an old school, tradition-based organization that has become all but obsolete to a new wave, popular organization – at least I hope, because it is nowhere near its destination. The show is also a study in the evolution of the leaders in the story from the previous conductor dealing with a new reality to the new conductor trying to reach his potential as well as the potential of the organization he is leading. 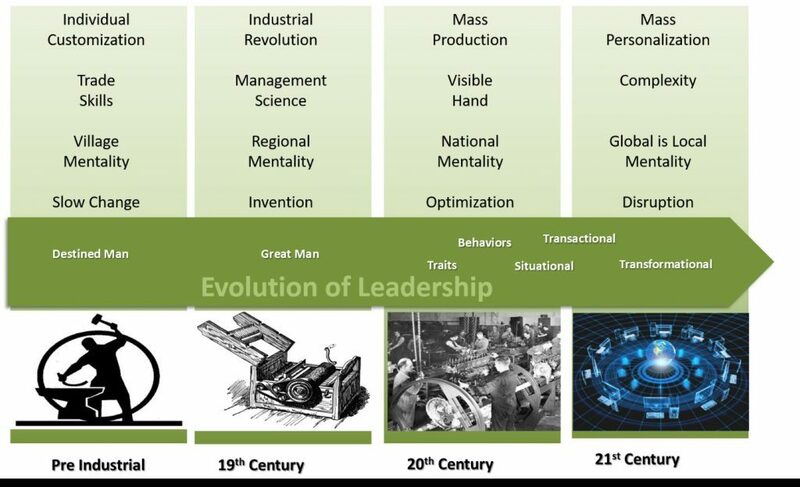 As we discuss what it takes to be a leader in today’s exponentially changing environment, we must also look at the evolution of leadership. A brief history of organizational development and the evolution of leadership theory shows how our expectations of leaders has moved from the concept of Destined or Great Man (using man here intentionally) who is born or taught to achieve great things to identification leaders who have the natural traits and exhibit the right behaviors to drive organizations to those that are developed. When we reach the apex of this evolution, we stand with a leadership approach that is more related to the conductor of symphony – listening, providing feedback, being aware of the big picture but enabling the talents of others to be highlighted – than that of general who commands and issues orders to be followed, defines roles and coerces performance from the soldiers. The conversations were with top leaders in their organizations. The leaders were both women, they were roughly the same age, and they were both living in the southwestern United States, both highly educated and experienced in business. I mention this to demonstrate that there were no immediate demographic differences that affected their thinking. One was the head of the largest regional division of a global company while the other was the head of technology for a mid-sized regional organization. The revenue level for both companies was also similar, around $200 million with perhaps a 15% spread between them. The key difference between the leaders, in this context, was their approach to leadership and how they harnessed the energy of their subordinates. The conversation with the regional leader was about an analyst who showed initiative toward the company’s digital marketing strategy. The regional office had previously created and executed the digital plan but, due to resource constraints, the function was now centralized in the global HDQ. Over the first six months of the new arrangement, the results were good globally but had fallen off in the region. Showing great concern, the analyst decided to look into the trends herself. She took home the data and worked on it during her spare time. Once she believed she had found the cause of the problem, she reported it to her supervisor who informed the leader. The reaction of the leader was not about the findings but about the analyst. She wanted to know why the analyst was bothering to do this work? Clearly, it was not in her job description and there were people paid a lot of money to do this analysis at the headquarters. She ended by stating that the analyst should focus on her role. The organization had plenty of work for her to do without this distraction. The leader was proud of the fact that she had enforced this discipline. The discussion with the technology leader was about a special program she had instituted. She tasked all the managers in her group to develop relationships across the organization. She wanted them all to get to know the people in marketing, operations, sales, etc. and understand each of their businesses as best they could. This program was about more than creating goodwill though. It was a search mission. They were tasked to discover opportunities and issues then think of ways to help through technological improvements. She did not send them out with a survey or a script but simply to establish a network, create trust, and develop solutions wherever they found opportunities. The overriding idea was that by finding the opportunities and proactively resolving them, they would eliminate larger problems over time. At the same time, she believed she was creating a stimulating environment for the team members and building their competencies. I cannot say I understand enough about these two organizations to know which of these people is more effective as a leader. What is important is that there are clearly two distinct approaches at play here. One is about setting constraints and limits while the other is about removing obstacles and encouraging creativity. One is about exerting control and the other is about creating emergent behavior. Based on these two discussions, I know which of these leaders I would put my money on to run a complex organization and train future leaders. I have consolidated a quick comparison guide looking at some of the key differences between leaders who hold a traditional mindset and those who utilize transformational approaches. This is not original but a compilation based on several sources on this topic, not the least of which is the book, Organize for Complexity by Niels Pflaeging and his use of the x-theory/y-theory construct. Others include the VUCA command comparison and several general descriptions available in multiple books on the subject. One should not think of these as two buckets of classification, but as points on a continuum. None of us are fully one or the other but somewhere in the middle and evolving. Even as I study this topic and try to be an adaptive leader, I often find myself reverting to the traditional mindset. When things get challenging, I can’t help but think “Can’t people just do what I tell them?” or “Why do I have to deal with so many questions?” or “Why can’t people just do their jobs?” When I hire people, I find myself considering whether the person is a good “soldier” who will carry out orders. As an employee, I find that I sometimes just want to be told what to do. I wish I could just follow a leader and not have to think so much. It is a difficult transition to make. One key trait of a transformational leader is the realization that they cannot go it alone, that distributed intelligence is exponentially greater than centralized intelligence. The people at the top must be willing to suspend ego and be brave enough to seed the organization with leaders who also exhibit these traits then give them the room to maneuver. 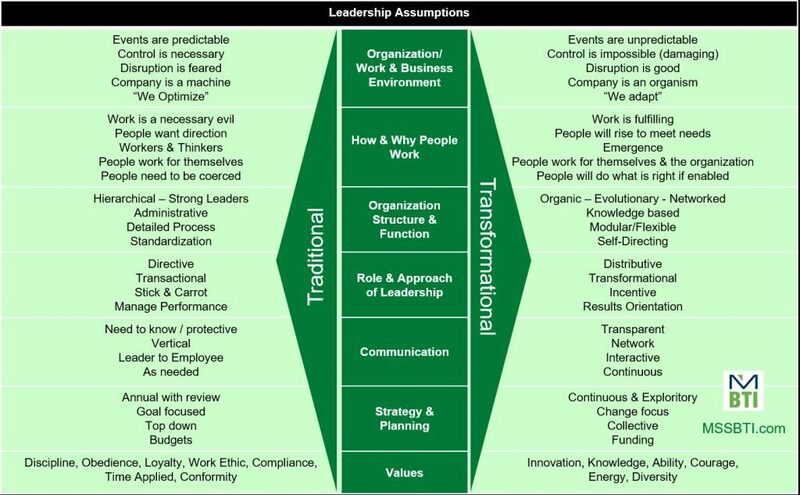 I note this because earlier I used the analogy of a conductor vs. a general, but in fact one of the leading organizations in applying transformational leadership is the US Military. This is chronicled well in the book Team of Teams where Stanley McChrystal and team discuss how they adapted to a new kind of war and learned from their failures, but it is also from personal experience. Most of what I have learned about leadership comes from my father, a Colonel in the US Air Force and a graduate of the Air Force Academy. He was a student of leadership and taught me that all great leaders think of their organization before themselves, show empathy, demonstrate integrity, trust their people, and are constantly learning. So, I will end with this lesson from the leader who spoke at his college graduation ceremony in 1963. “Leadership and learning are indispensable to each other” – John F. Kennedy. Charles Zulanas, MSS Senior Consultant, contributed to this article. 3 Alvesson, M., & Sveningsson, S. (2003). Good visions, bad micro-management and ugly ambiguity: contradictions of (non-) leadership in a knowledge-intensive organization. Organization Studies, 24(6), 961-988. 4 Austin, R., & Larkey, P. (1992). The unintended consequences of micromanagement: the case of procuring mission critical computer resources. Policy Sciences, 25(1), 3-28. 5 Sapienza, A. M. (2005). From the inside: scientists’ own experience of good (and bad) management. R&D Management, 35(5), 473-482. 6 Lengnick-Hall, M. L., Lengnick-Hall, C. A., & Rigsbee, C. M. (2013). Strategic human resource management and supply chain orientation. Human Resource Management Review, 23(4), 366-377.